Pano ("upper") and Kato ("lower") Akourdaleia are two pretty little villages that are situated high on the Laona Plateau, fringing the Akamas peninsula, approximately 20 km north-west of Pafos. Both villages offer splendid views over the wide Chrysochou valley and the crystal-clear waters of the Polis and Latsi (Latchi) bay and towards the imposing range of the Troodos mountains. This small picturesque village offers a generous sense of serenity and calmness, accompanied by the beautiful chirrup of the birds. The natural environment of the village, is rich in vegetation, vines, carob trees, almond trees, citrus trees and grain, but it is also surrounded by breathtaking gorges and wildland, inviting the visitor into an adventure of exploration. According to one tradition the village acquired its name from the French phrase "a cour de l' eau" meaning "in the course of the water". There are many other stories as to the meaning and origin of the name Akourdaleia. Our preferred version is that it comes from the combination of two greek words which romantically translate to "listen to the birdsong". Both the villages are small, and some years ago the Laona Project helped to breathe a fresh air of optimism into them. The Laona Project was a successful scheme that helped to restore and repair old buildings in five of the Laona villages. The project encouraged agro -tourism in the area, and gave financial support to the craftsmen. Both parts of the village are a popular destination for visitors with special interests. Its a bird watchers dream, as every spring and autumn millions of birds fly over the island, many of them resting in these rural areas. You can see many rare species in the countryside surrounding the villages. If youre more keen on the flora of the island, there are many rare and beautiful flowers to be seen including many different orchids. The gorge of Kyparissia, which takes its name from the cypress trees that grow on its banks, lies between the two villages. It's a perfect place to sit and admire the natural beauty and is always a popular spot for artists and photographers alike. Fringing the Akamas peninsula, both villages offer terrific views over the Chrysochou valley towards the foothills of the Troodos mountains and these are particular dramatic at sunset. So why not enjoy a glass of wine while you watch the sun setting and breathe in the heightened fragrance of the herbs and orange trees as dusk falls? Shrouded by a veil of the prettiest almond blossom, these villages are at their absolute best in the springtime. Although they are beautiful all year round as they are always perfumed by citrus blossom and wild herbs, and in the winter months the smell of wood smoke from countless open hearths is always welcoming. The pretty little 16th century church of Khryselousa in Pano Akourdhalia was renovated. This church was built near the point where two streams meet and ontop of an old temple of Artemis. and the church is dwarfed by a huge olive tree and there is an old stone olive press nearby. The schoolhouse was transformed into a herb garden where visitors can wander and buy a variety of fresh herbs. A Visitors Guide to the Herbs of Cyprus Planted in Pano Akourdaleia Chryseleousa Herb Garden. Under the thick shade of the old cypress trees of the old school you could unwind playing backgammon with the locals, watch wandering artists tranform plain canvas and paper into works of art, or you could simply rejuvenate yourself with a tea made from herbs freshly gathered from the garden and lovingly prepared by Mr Mantis who will give you an inexhaustive and fascinating narrative on anything from instructions of how to prepare your own herbal drink, to stories of how the high society of the ancient Romans used take time off their governing duties and relax in thermal spas not far from where you are now unwinding. In amongst the traditionally-styled whitewashed houses nestling between almond trees, there is a small coffee shop in Kato Akourdalia. Youll also find what used to be the village manor house, which has a rich history dating back over a hundred years. 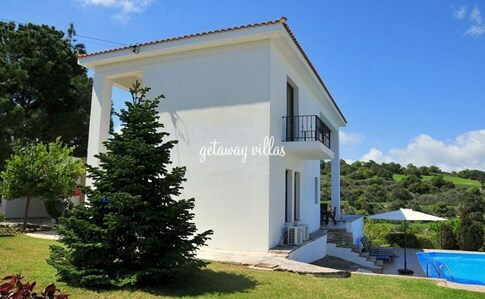 The building has since been renovated and converted into a group of self-catering suites for holidaymakers with a restaurant downstairs offering traditional Cypriot cuisine. There is no kiosk or shop in the village, but the village of Kathikas is only a few minutes drive away and has a few shops and also a few excellent taverns. The Museum of Folk Art is situated high on the hillside in the old schoolhouse. The museum houses all sorts of interesting artefacts from years gone by, many of which were used to cultivate small areas of land with wheat, chickpeas and barley. There are hand ploughs with stout wooden shafts and several large metal sieves used for sifting the soil. There are traditional costumes too, and there are faded old photographs of the village men resplendent in their vrakas and stout leather boots and the women in dresses of striped hand-woven cotton with a matching headscarves and large protective aprons. The villagers would wear these costumes for all big celebrations and would weave the cloth on large wooden looms like the one that stands proudly in the corner as well as making colourful rugs for the walls and floors of their homes. Outside the museum, a traditional clay bread oven can be seen with its smaller side oven that is used to cook the popular local dish kleftiko, which is chunks of lamb that are baked slowly in terracotta pots with marjoram. Close by, stands a zivania still which was used at the end of the grape harvest to make the local variety of fire water. As well as making your head spin, zivania is also known for its medicinal properties. So you can either drink the stuff to forget about your aches and pains, or rub it into any sore areas the end result is the same! On the outskirts of Kato Akourdalia is a track which leads to the pretty whitewashed church of Ayia Paraskevi. Of cruciform style with a dome, the church was originally full of frescoes and the villagers say the church dates back to the 15th century. Simply decorated there is a stone altar inside with the remains of an old icon dedicated to Our Lady. The church was restored a few years ago.